My name is Hannah Nieh. My father was born in Taiwan, as part of the post-Second World War exodus from China. A tragic mix of circumstances left him at an orphanage for the majority of his childhood, but eventually he was reunited with my grandmother. His roots are the product of a forbidden marriage. My grandfather was a blue collar military man from Sichuan, in western China, while my grandmother – my Nai Nai – came from an esteemed family on the east coast. She was betrothed to a man deemed suitable by a matchmaker, a man and life she ran away from when she met my grandfather. My mother was born in a military hospital in California, but grew up on the outskirts of Chicago. Her mother’s roots go way back to immigrants from the British Isles fighting in the American revolution. A grandfather clock from this era, passed down the family line, still sits in my grandparents’ house. The American roots of my mother’s father start a little later, with German and Swiss pioneers heading Far West in covered wagons. I still cherish a necklace of amber beads that my great-great-grandma brought along as a young girl. And with these backgrounds, somehow my parents met. Despite a trying childhood, my father spent two years in the army climbing the ranks. He graduated top of his class and went on to get a master’s from a top university in Taiwan. His classmates are among the political top dogs in Taiwan today. With a scholarship he went to study in the United States, where he obtained a second masters degree. While he began pursuing a PhD, my mother was studying for a master’s. As fate would have it, my parents – who could not have been from more disparate universes – found each other. Shortly before his business brought him to Hong Kong, my father was doing research in Japan. That’s where I was born. My two brothers were born in different countries to myself. 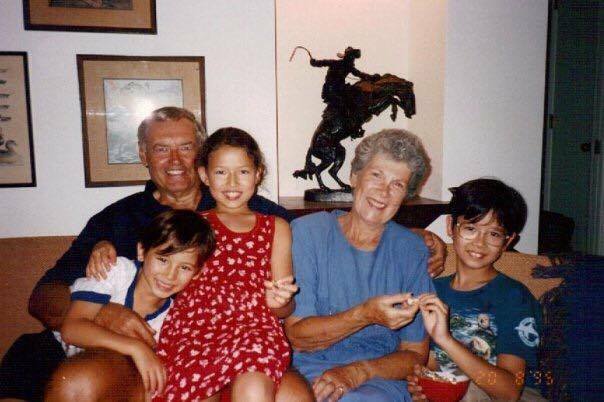 Throughout my childhood, we would leave the sticky, sweltering summers of Hong Kong behind, and stay in the States at my grandparents’ idyllic home in a NYC suburb for the entire summer. I remember quite clearly identifying as a proud American. We would wave our flags and ride our bikes during the neighborhood Fourth of July parade, and enjoy the Norman Rockwellian freedom of roaming the neighborhood with all the neighborhood kids. It was blissful. It was heaven. The most carefree time. In Hong Kong, many of the expats would identify with a parent’s culture. The school I went to was bilingual in Mandarin Chinese and English, a rare offering for the early to mid-nineties. I learned how to write in Chinese first. The symbol-based, more illustrative aesthetic came more naturally to me. When I was ten years old, my parents relatively quickly decided to make the great leap and move the family to the United States. 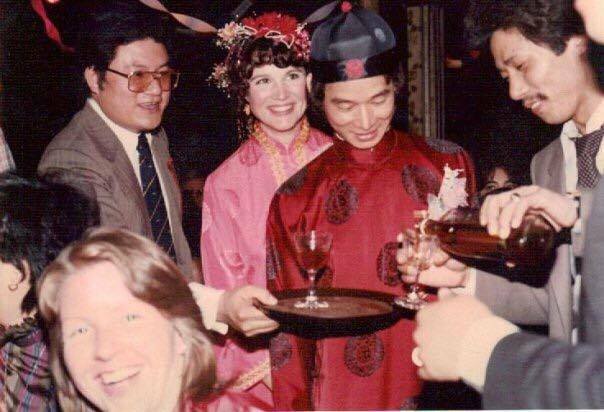 My father would still go back and forth to do business in Asia, but the looming handover hanging over Hong Kong was concerning enough to sway them towards a move stateside. I remember watching the apartment complex of my childhood fade into the distance out the car window. En route to the airport, tears welled in my eyes. Even though I felt I was ‘American’, and loved ‘America’, Hong Kong was the magical concrete jungle stomping ground of my childhood, and I felt the weight of change upon me. The first time that identity even entered my vocabulary was on my first day of school in an American public school classroom. It was sixth grade. The culture shock was stark. The kids were loud. Their independently chosen clothing felt bright and blaring; as did the hair gel, hair dye, expressiveness, sneakers, and laughter; the general decibel increase reverberated through my ears. On the school bus children asked where I was from; if I spoke American; where my accent was from; who I wanted to go out with… I had barely confessed a crush, let alone understood what they were talking about. Here I was, this halfie who was supposed to be American. I had been lifted from my uniform-clad international private school haven into a throng of sprouting American adolescents; into a culture where it wasn’t cool to be polite, wasn’t cool to be quiet. That first school bus ride home, the bus zoomed past my street; instead of speaking out, I waited till every kid had gotten off the bus before sheepishly confessing this to the bus driver. From that day forward, I knew I was not really American. It felt like my whole life I had been telling myself something that wasn’t quite true, something that rang false. The question is: what was I? Fast forward several years, past relatively smooth and joyful middle/high school milestones: making friends, performing leads in musical plays and ballets, final exams, sports games, a lot more ballet training, pseudo dating etc… My exotic look and identity didn’t cross my mind much, apart from one racially bizarre comment from a friend, telling me not to worry, “that one day I’d find a hot guy of my racial mix to be with.” A strange statement, considering my very existence was standing proof that partners could be different – racially and culturally – and end up together. I remember it bothering me at the time, without understanding the full scope of why it was so wrong. At 16 years old, I left home to dance with Ballet Chicago to follow my dream: pursuing a career in the performing arts. That few-hour flight heading east from the West Coast was enough to make my ethnicity – my look, my mix, my ‘identity’ – stand out that much more. Between there and a stint in Richmond with Richmond Ballet, I was either the only one, or one of two remotely ethnic minorities. My Asian-ness became more apparent. Not always in a negative way, but at times in a stereotypical way. Perhaps as a mechanism to connect, I would perpetuate these stereotypes through humour. Even on my first Broadway National tour out of NYC, I was the only ‘minority’ in a very White cast, and I’d let the typical jokes fly. My Cantonese accent (flawlessly preserved from hearing it in Hong Kong as a child), was a go-to party trick. I have made good friends through this ice breaker. In fact, I’m friends with the stars of ‘Gossip Girl’, because I sang ‘Happy Birthday’ in that accent to them. Have I somehow betrayed, or been racially insensitive to part of my roots? I’m not sure. Although, I’m a firm believer in humour being one of the most powerful forms of social reflection. Now, my life has taken me full circle, back to Hong Kong. After a few years doing singing contracts throughout China, Korea, Macau, and the Philippines, I found myself back at the scene of the crime. (I initially typed that as a simple expression, but it has just now occurred to me that before the mid-70’s, my parent’s marriage would literally have been against the law in the United States; this sends shivers down my spine). I was back where I first took in the world, learned how to communicate in multiple languages, how to connect, how to be, how to feel. Perhaps in a profound turn, it is also here where I have now met my fiancé. Another multiracial third culture kid, with many complex stories of his own. Was the cross section of cultures the reason why we fell in love? I can’t be sure. Is there a deep, unspoken understanding? Undoubtedly. Being third culture and mixed can feel like being a member of a secret club. You can always spot fellow mixies, can usually speak multiple languages, and understand the tempestuous navigation it takes for multiple cultures to harmonise. It can feel like a gift, and cause confusion simultaneously. However, in my more than 30 years, I have realised, as the complexity of humanity melds, complicates, and enriches; that no one feels certain in their identity. It might be the most human thing of all to be on a quest to discover yourself, and be unsure where you belong. My story may be more globally scattered and convoluted than most, but there’s a painfully human essence that remains. My family is my home, yet I have no real home. I don’t know where I belong most, yet I belong everywhere. Traveling is my most natural state, and I’ll forever remain on this quest to understand myself, and my fellow human beings.